Join us at our Pitch Day to meet and network with our startup Founders, mentors and partners! 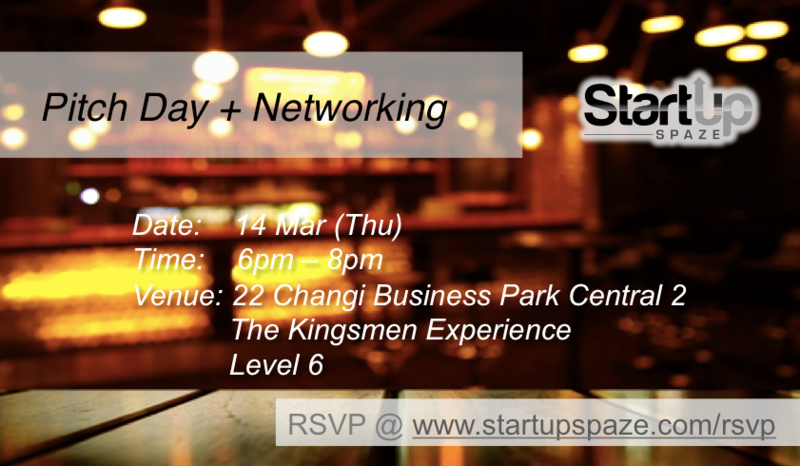 Spaze Ventures is a startup incubator based in Singapore that provides seed capital and hands-on mentorship to entrepreneurs from idea-to-seed stage technology startups. We focus on seed stage technology startups in a broad spectrum of sectors including financial services, education, e-commerce, media, F&B, artificial intelligence, blockchain and enterprise technology. Spaze Ventures is an Accredited Mentor Partner (AMP) under the StartupSG Founder scheme, appointed by Enterprise Singapore, where it provides mentorship and startup capital grant to first-time entrepreneurs with innovative business ideas. Spaze Ventures was incorporated in 2014 to help entrepreneurs launch their startup at the earliest stage possible, our eco-system is also supported by more than 30 experienced mentors. We currently have a portfolio of 17 startups in the region.